Take Back the Knit - ZineWiki - the history and culture of zines, independent media and the small press. Take Back the Knit is a zine by Jae Steele of Montreal, Quebec, Canada. 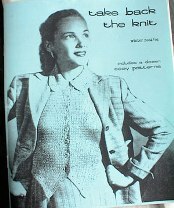 Each issue features articles about knitting from a feminist perspective, as well as a dozen knitting patterns. Issue #1 features "wintery" patterns, while Issue #2 features "summery" ones. A third issue has been in the works since 2005. The first issue was printed on a photocopier and collated by hand, while the second one was printed offset with a colour cardstock cover. It includes contributions from knitting writers such as Jodi Green, mk carroll and the yarn harlot, Stephanie Pearl McPhee. It was this zine that inspired the creation of the weblog Domestic Affair early in 2005, though the blog now focuses more on vegan whole foods recipes than knitting. This page was last modified on 25 September 2007, at 02:31.